...AND BEAUTIFUL! Today it was reaffirmed to me that there is nothing in my world, other than my children, as powerful as colors - the rainbow - the color spectrum. My youngest was playing on my computer with some software I have that he is familiar with, due to using it at school. From that program, he was able to scope out the most beautiful swirling rainbow of colors I've ever seen in my life...and believe me, I have worked plenty hard to find miraculous colors everywhere I go, being the color hound that I am. From the moment he put this swirling lightstorm on my desktop I have been lit up like a lightbulb. I am happy as pie, full of energy and almost dancing in the rain. I just think G-d is so cool! There is no doubt in my mind that G-d was having the best day of G-d's life when the "aha" moment and idea of the rainbow came along!! Today's card is dedicated to every single color between the lightest pink and the darkest indigo! SQUISHY HUGS. 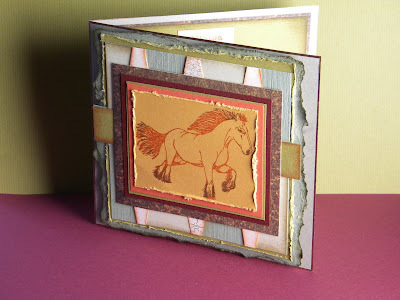 ...finally ordered and received (from Firecracker Designs by Pamela) my first set of horsie stamps! I am SO excited. It took me a while to get the courage to do this because the shading seemed a difficult task. So, for my first attempt I created a rock and roll stamp. 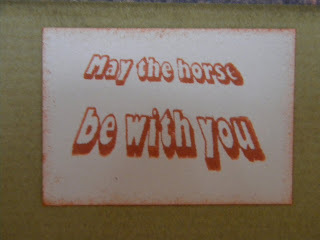 First - for those who aren't familiar with the technique - I put the stamp into the Terrecotta (CTMH) ink and then rolled the outside of the stamp in the Brown Bag (CTMH) ink, thus giving the horsie a two tone look in just the right places (at least I think so...lol.) I got a little carried away with the layering on this card. I was having so much fun, I just kept going and going like the energizer bunny! Today's card is dedicated to The Royal Winter Fair Horsies (which was what I was remembering as I was stamping.) SQUISHY HUGS. ...DOMINOCUS! I'm wondering if this year I'll have the nerve to keep the house lights lit and stay home Halloween night? Year's passed I've gone the rounds with my child, secretly enjoying not being home and getting scared by the 17 and 18 year olds that come to the door in their life like costumes. But then, I have lamented not being home for the itty bitty babies that have bunny ears and tiger tails and are carried by their proud parents for their very first Halloween shell out! I remember that with my own older children...it was SO exciting. So this year it is a toss up...my conscience is getting the best of me. Does my young child go out with his other parent and I stay home this year...facing my huge fear of Halloween! Speaking of...what happened on Vampire Diaries this week? Drat...I missed it! 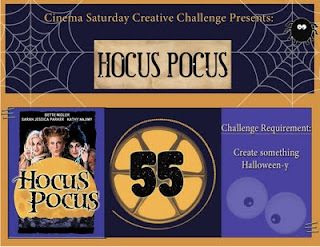 Today's card is an entry to the Cinema Saturday Challenge: The Movie Hocus Pocus with Bette Midler. SQUISHY HUGS. Well, (story continued) this weekend I discovered something about myself. My fear of computers was in the way of my even considering the digital way. Due to the fact that I fell upon (and in love with) the digital stamps at The Cutting Cafe I was determined to "face the fear and do it anyway!" Regina was able to ease me into the process of digital stamping and I am SO excited. The TRUE benefits for me: I can spend time with my copics (Ya Hoo - they might end up paying for themselves, though I doubt it, but I LOVE them anyway, my SU markers, prisma's and gamsol and SU wonder crayons. I can color the day away with a simple push of a button on the computer. I love the minimal space required for these stamps as well. 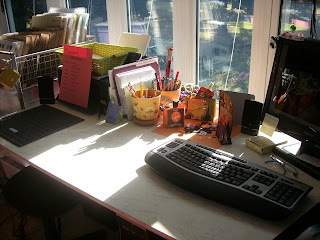 I hadn't thought of that benefit previously - just storing them on my computer - making room for more rubber stamps (see sisters, I haven't left ya!) 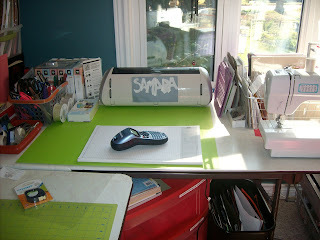 I can use my numerous and beautiful rubber stamps or *ahem* DO DIGITAL (I feel so grown up and computer saavy!) I did recognize something though, at heart, I am still in Kindi-Garden, with my nappy mat, loving coloring! So now I get the choice...YAY. Win-win. Today's card is therefore dedicated to THE CUTTING CAFE and a very patient and helpful owner - my new digi-stamping therapist - Regina Easter. ...MUSIC IN THE STORES YET? I haven't. But I am waiting. It should be about 5 minutes after Halloween is over!! There is something about Christmas muz-ac in elevators, in the stores, and even piped into the washrooms at Wallmart, that says "I'm coming...get those cookies and milk ready!" Well, I don't know about you, but this season seems to bring with it lots of pressure for the people who celebrate it. Is it the spending, the entertaining, the office parties...or just all of it? Well, this season, what about setting a mantra. THIS year will be different, and why not! "If what you're doing doesn't give you the results you want, then change it." I know I do that all the time with my cards. Maybe easier said than for Holiday time. 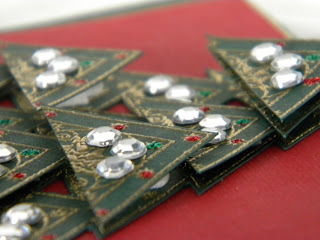 Today's card is dedicated to taking the complications out of the 2009 Holiday Season and KISS instead! SQUISHY HUGS. P.S. Huh...just realized my card is kinda complicated! oops. lots and lots of cutting with my Judikens (fantastic and teensy) exacto knife! 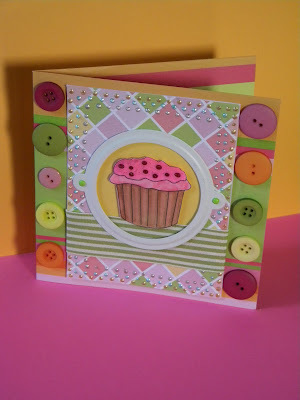 A very fun card to make. 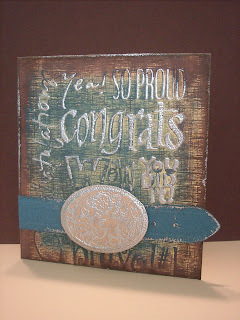 The celtic stamps can be put together a bazillion different ways! ...FOREVER! When I read this stamp from Stampin' Up it really hit me...how many people are there in my life that I can truly say we are together forever? Hmmm. Good question for most of us to ponder. It can take us to places within that don't usually get examined, leading us to a real appreciation for those people who are 'lifers! Today's card is dedicated to all those loyal and wonderful people in our lives. SQUISHY HUGS. ...INSPIRATION! 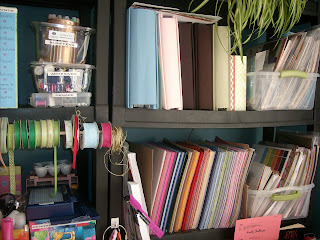 When I need inspiration I take out my favorite paper and favorite scrapbook and card making magazines and sift through both. I then just sit with it. It took me a while to trust this process. 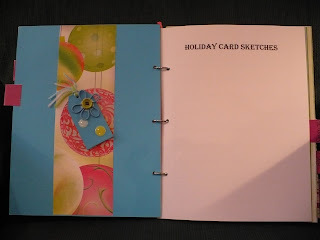 It is as if, eventually, my paper magically gets legs and walks over to me and says "wake up...here we are" and it is as if I get wacked on the forehead (like that veggie commercial) and am full of beans to create a card. Now, I can't promise how that card will necessarily turn out...but I always feel great that my 'creator's blog' is removed and I am on my way to creating a new card. Today's card is dedicated to that process. SQUISHY HUGS. 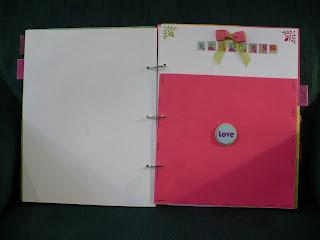 Accessories: Rub On - Summer Love (SU), Liquid Pearls - Platinum, Mint Green, Cord Button (eek, I forget - SU? ), Crochetted Flower (My Aunt Betty), Nesties Labels, Pierceabilities. ...I LEARNED IN KINDERGARDEN! Hmmm is that really a true statement? Perhaps. I know in the manners category it sure is true. Back in the day, there was something known as "the strap!" Yikes....yes, I received it a few times. But it was worth it! Receiving the strap meant you were full of adventure, passionate about what you believed in, willing to be a trailblazer (and a whole bunch of other things that will go unmentioned.) I prefer to focus on the positive aspects of receiving the strap...ahem. But it made an impression. It was at that moment, I believe, that one decided how they were going to relate to the world around them - were they going to live according to the status quo, or were they going to push the envelope, walk to the edge, stick their neck out, often way too far, and their nose into places it certainly didn't belong! Well, Today's card is dedicated to that "back in the day" moment when I, for one, know that I made my decision where I was going to set my life path. SQUISHY HUGS. Please click on picture for detailed view. ...EXCEPTING THAT I HAVE 3 PARTRIDGES ON THIS CARD! Oh, with me, everything has to be about 3. And why is that you ask? Well, any one of my three cubs (remember, I'm a Leo) could answer that. So decades (centuries?) old traditional songs even get transformed into 3, if I can manage it. My art style is - color everywhere and very little white-space. I've noticed how much I am being drawn to white-space cards lately. So, I set myself a challenge. 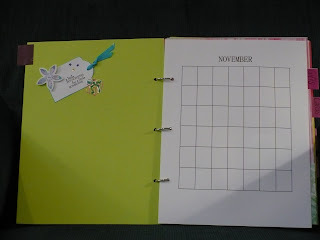 For the next little bit, white will show up on my craft table and I will tie my hands up so as to not add that last drop of color on every single inch of my card, thinking that something MUST be missing. Today's card is dedicated to all the wonderful scrappy and happy people out there who already know how attractive white space is, when featured on their beautiful cards. SQUISHY HUGS. 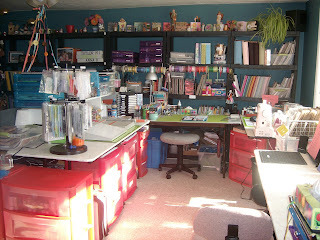 Well, I thought it was time to show some pics of where I do what I do! They likely speak for themselves. I'll be brief. 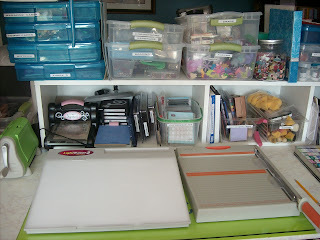 To create, I need to have everything within hands reach (or stretched reach.) I also need to be able to see what I have - you know, out of site out of mind. I'm fortunate that what comes into my house goes straight onto a shelf, not under the bed, in the back of a cupboard, between the mattresses, and brought out one item at a time, so as to not give my respect 'other-half' irreversible shock! My puppies seem to take my over indulgence in art supplies with a graceful attitude as long as they also get a treat...bless their hearts. SQUISHY HUGS. ...ESPECIALLY FOR A 12 YEAR OLD. Yesterday, I attended a funeral for my friend's father who had died of a heart attack. My friend was there when his father had the heart attack, and it was very hard for him going through the funeral. 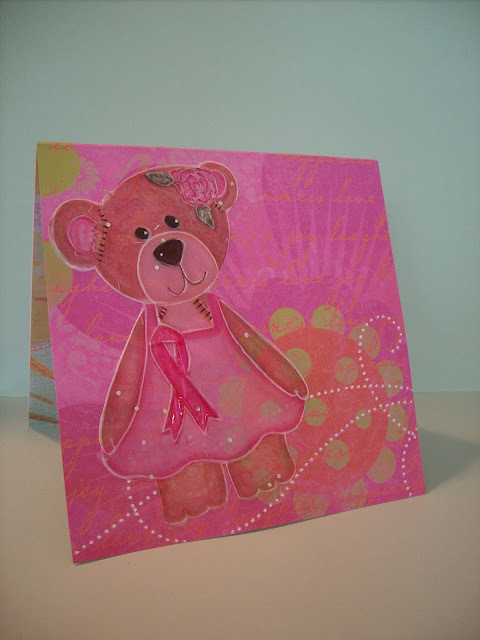 This card is one I made in honour of my friend and all the people who lose parents at a very young age. - Written by and card made by, Taylor, 12 years old, Samara's son. I cut the second flower blackout (3") were the square and the flower meet. 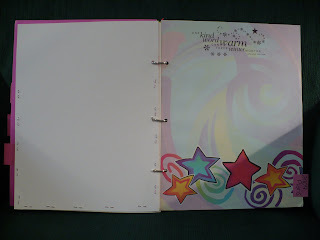 Back to the inside, (see below) I traced the flower on the front onto the inside with a SU Black Journal Pen. 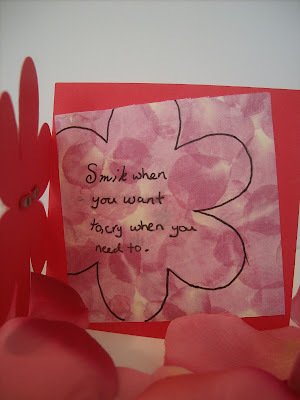 I then wrote: Smile when you want to, cry when you need to. Which is how I felt when I was comforting my friend. 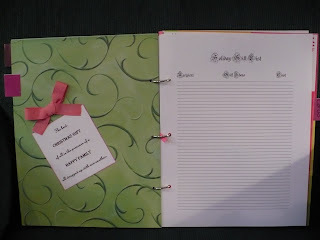 I advice tracing and writing in pencil first so that you don't make any mistakes. ...IT'S OK! How often do you hear this message when it relates to Breast Cancer? Not too often. I don't know about you, but I hear "If you want to cry, it's OK" or "If you want someone to talk to, call me." I have a friend whose cancer, as she would say in her own words, is as stubborn as a beast. She is tired of being met by sadness, by people who expect her to be depressed or angry or, or, or. Wendy just wants to be asked "to go out on the town," even though the answer would perhaps be no. She just wants to be asked to "go have a laugh." She told me that, to her, it seems like everyone around her has cancer and is depressed and sad and that she is being "just like Wendy." I don't underestimate the many, many differing moods in between the ones I describe above, having walked alongside many women and men in my past profession as Chaplain. However today, it just felt right to bring out the message of the rightness and place for laughter, joy, and mostly the blessing that many people experience on the face of tragedy. 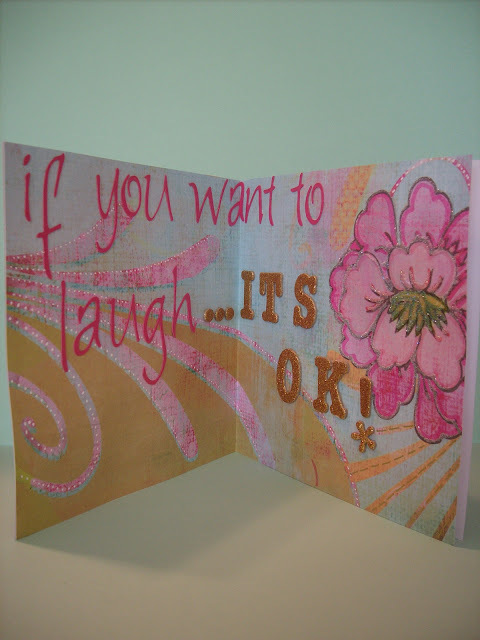 Today's card is dedicated to the women, woman and men that walk the walk with breast cancer and want to still have good, whole-hearted belly laughs!!! SQUISHY HUGS. 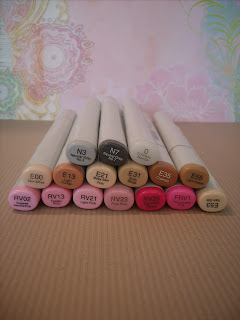 These are the Copics I used to color in the beautiful and cuddly pink ribboned bear below. 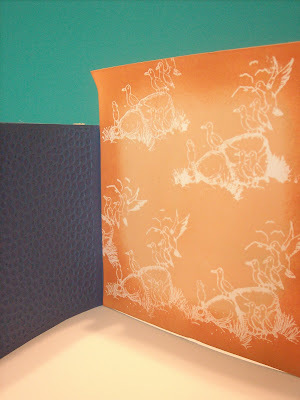 My little friend was embossed on Vellum first and then colored with Copics. 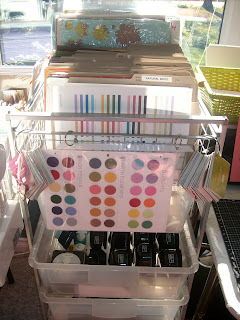 She was highlighted with Stampin' Up markers where fine points were needed. I used a white Gel Pen for faux stitch marks. 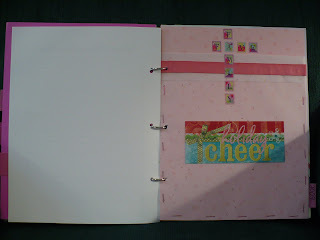 Ribbon is highlighted with Glossy Accents. 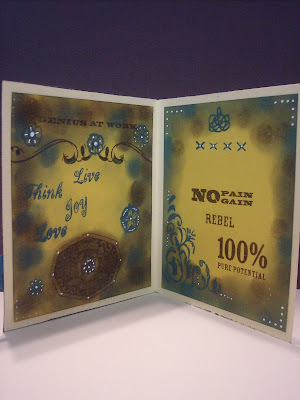 Paper is The Sasha Collection by Prima Marketing, letters are cut out from the cricut expression (calligraphy), gold letters are Thickers, highlights on flowers are Stampin' Up Markers and glitter dust with glossy accents highlights. ...I was told that is what Halloween is REALLY about! 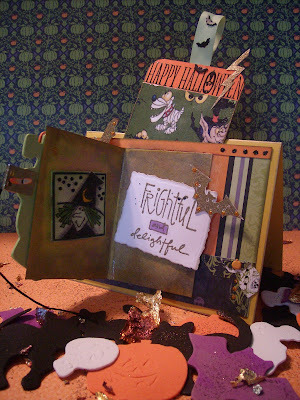 Tonight I watched The Vampire Diaries and am now in the mood for a spooky card. 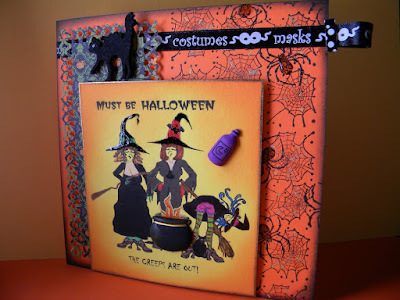 Well, how about a spooky card that can be filled up with goodies? Mmmmm. Yummy...caramel apples for my family! 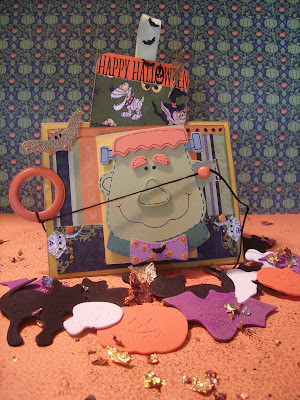 Today's goody (below) is the prototype for many treat bags that will be made to give out on Halloween Night. It is a pouch with a cellophane bag on the inside that holds 1/2 cup of candy cones, spiders or jelly beans (even if they come pre-packaged.) 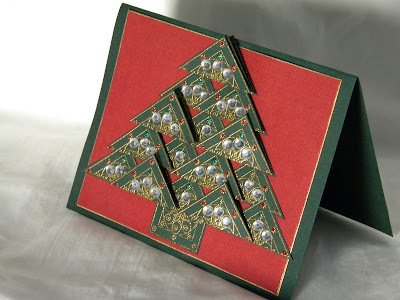 The card is a triangle shape, attaching together (cello bag and outer cardstock) at the top (orange end) tied with the ribbon, through punched out holes in the cello and cardstock. This little goodie bag is dedicated to the pumpkins and goblins that will get all dressed up and trick or treat in their spookiest ways in a fortnite! Whooooooooh.....SQUISHY HUGS. ...HALLOWEEN! Today, for my 2 different cards (the first one shows the inside as well) I decided to go with the happy part of Halloween. Halloween has always been a tad frightening to me, both as a child and even when going up to the doors, as an adult, with my children. I feared the parents who dressed up in the real life scarrrrrry costumes. Too real for my sensitivities!!! Secretly, I was thankful that it rained most Halloween nights, when I was young. That way my mom volunteered to drive me around and often she walked up to the door for me. What a mom, gotta love that! So...when I saw this rather happy Frankenstein at Michael's, I couldn't resist him. Ok, the bats on the card are still creepy (I remember my dad using a broom to shoo them out of our cottage while we stayed behind doors peering out - ewwwww- creepy!) 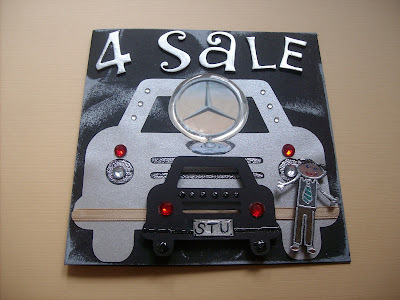 but all in all, I attempted to create a rather fun looking card. 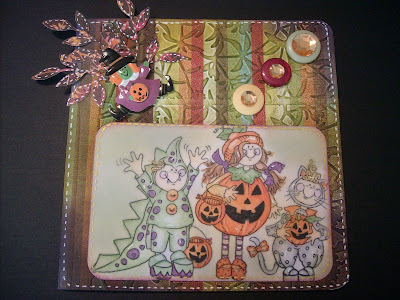 Today's card is therefore dedicated to the HAPPY in Happy Halloween! SQUISHY HUGS. ...COWBOY'S AT HEART! This card is an entry for a swap that is entitled "for a cowboy's heart." Well, being a person who LOVES belt buckles, this stamp set was irresistible. If only I could figure out how to make my own...I'd hop right on it. Do you think a paper crafted one would hold up?? Today's card is dedicated to all those people who love a great belt buckle and the rebel part of us that choose it! SQUISHY HUGS. ...WHAT DO YOU SEE? 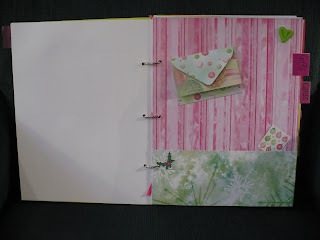 This was an exercise I gave myself last evening, while sitting at my craft table. I relaxed, cleared my head (as best I could) and let my mind wander. My "mantra" was to create what was in me to create rather than using a style I was used to, colors I might prefer or tools I am comfortable with. 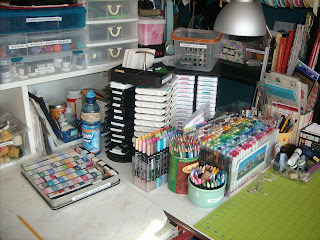 When I opened my eyes, my hands just went for certain papers, inks, tools and accessories. My table was covered with items I wondered what "they" would create. 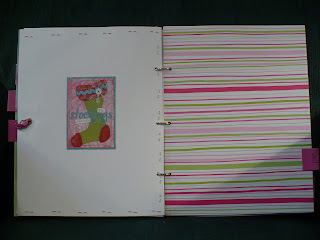 So, I did the normal cut the paper, scor it and again - stop. My mind was not in charge of this and my history certainly wasn't at play. There was nothing familiar in what I was about to (as I later discovered) do. This card is dedicated to breaking the mold, stepping out of the comfort zone, becoming what you were not (yet) 5 minutes ago! You may find yourself, like I did, quite pleased with the results. SQUISHY HUGS. TECHNIQUE: I laid down a Glimmer Mist Stencil (actually 2 of them, one on top of the other) and started sponging all around them. First Olive Green, Then a bit of Pumpkin, Then a mix of chocolate, cocoa and yellow. I found something developing...it seemed to me the color wanted to extend from the top of the tree outward. I took my sponge and "swept" outward, using a combination of pumpkin and yellow. I sponged a tad of olive green and brown at the base of the sweeping where needed. 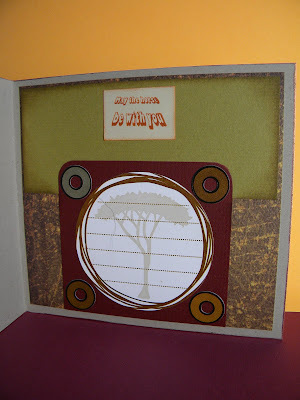 I then took a stamp from the Basic Grey Indian Summer Set and laid down cocoa branches. They felt barren so I added a variety of colors to bring them out. The bird, also from the stamp set, asked to be in similar hues to the highlights in the branch. I used Copics to fill in the bird, yellows to be exact. The acorn stamps are also from the stamp set. I wanted the drama of full size acorns beneath the tree, along with a seed branch. 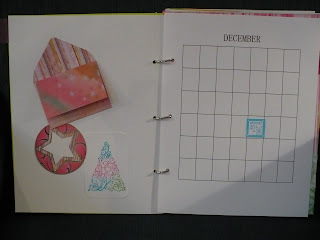 I stamped them in cocoa and filled them with Copics. The seeds were then covered with Glass Effects and the acorns were covered with Spica Pen in Copper Color. The bird also is colored, on top of the Copics, with red and orange Spica Pens. 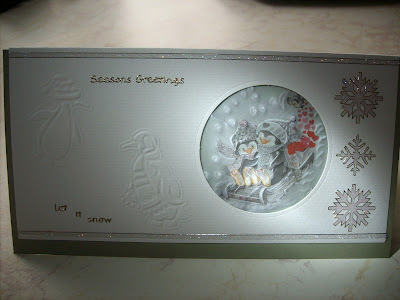 The paper at the top inside of the card (and also the theme inside the card) is from Basic Grey Indian Summer. The trim is punched from a Martha punch. 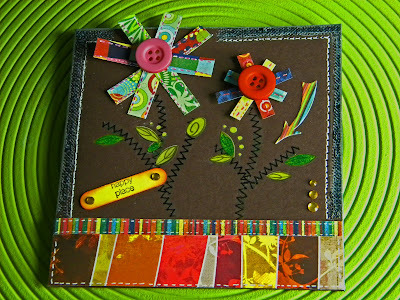 The trim on the card is also from the Basic Grey Indian Summer Paper Pack. 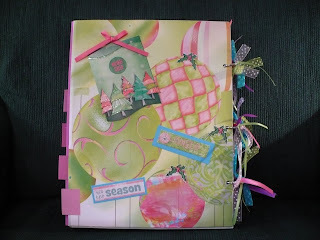 The brads are from Bo Bunny Melody Icandy Brads while the flower and tree ornaments are also Basic Grey's complimentary accessories to Indian Summer. 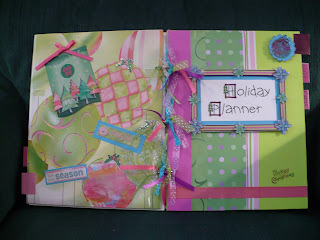 Once finished the color portion of the card, I highlighted certain portions of the card with Gold Leaf Gel Pen. 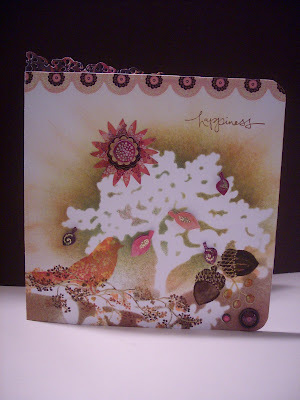 And finally, the stamp I used for "happiness" is from Stampin Up and is called Warm Words. The Word is stamped with Chocolate Ink from Close to My Heart. Accessories: Glossy Accents, Basic Grey Stick Ons, Gold Gel Pen, Blender Pen. ... in Nights in Rodanthe. I'm a little behind the times with movies, choosing to rent them rather than go to the big screen cinema. This time it was worth it! I got to rewind...a Richard Gere movie is just like that! This was a particularly touching movie, I found. It coupled my love of the ocean, the complications and tough work involved in relationship and the most natural living environment one could ask for...maybe a little too natural in parts of the movie. However, it all worked (especially the close-ups of the Mister!!) Today's card is dedicated to those people who have found their perfect hide-out with a breath-taking view and their own RICHARD GERE look-alike to share it all with!! SQUISHY HUGS. ... CHILDREN. This is the time of year where one is offered the opportunity to take stock of the blessings in one's life - to give thanks for what has come into our lives through Grace - a gift bestowed upon us without having earned it and without owing anything to anyone for it. It is a time to quietly reflect on what is good, what has been accomplished, what is around us and what is within us, that both make us who we are and make us behave the way we do. It is a time for generosity - to thank those people we love for being just the way they are - in their natural state and not a state we might wish for them. In summary, it is a time for deep and thorough ACCEPTANCE ... acceptance for what has been - for what is - and for what will be. Today's card is dedicated to my three children. I give thanks to each of them, as individuals in their own right. Thank you Jordan, Ayla and Taylor for the wonderful, loving and deeply rich humanity and spirit you continuously deliver to this planet. SQUISHY HUGS. MRS. DOUBTFIRE: Off your Mercedes, dear, you own that big expensive car out there? This was such a funny line! For today's card, I have offered up a card I entered in Sankari's CINEMA SATURDAY CHALLENGE...and yes, Mrs. Doubtfire is the movie of the week. It is a wonderful little challenge site. Each week a new movie is picked. Our job is to draw something from the movie that spoke or speaks to us and create a card to be entered into the challenge pot. We can watch the movie, should it be one we have not seen before, or study the internet, or ask friends, or read the book (speedily!) Although I have only entered this challenge two times (Pretty Woman was my first time - card is in a previous post) I am loving this challenge. Today's card is dedicated to all those kids who have the chutzpah to say "he's my G-d d--n father too (or mother as the case may be!)" SQUISHY HUGS. 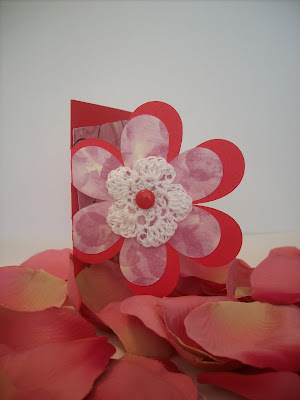 ...For a close up of the details of this card, just double click on it. 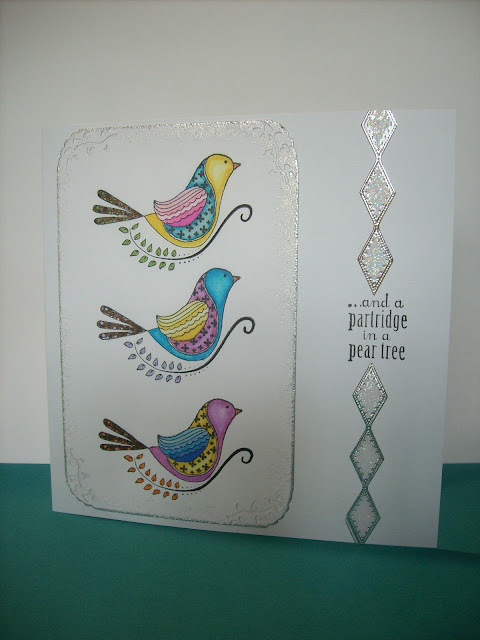 This card was a joy to make! 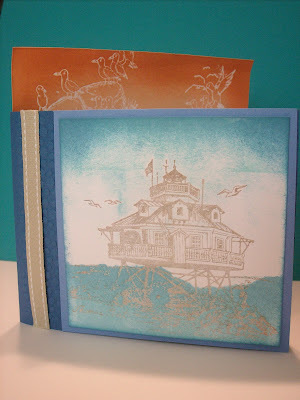 Using Embossing plates, Vellum, etching, and for the first time in my card making career, a pre-cut note card, I was able to create something very different than my normal bohemian mishmash style! I also played with lighting (nope, not Photoshop but rather a good old flashlight!!) to see what the effect can be of those multi-bazillion dollar camera accessories. That was so fun!! Today is dedicated to all you Penguin Lovers (number two son) and to the on-going Plight of The Penguin. SQUISHY HUGS. ...or so it is said! Although, I think it also goes that Purple is The New Black (for those people who don't like pink.) It all started with The Little Black Dress. I don't recall a trend setter that caused such a stir, and while doing so, stuck around on store clothes racks for so long. For me though, I love Pink, and always have, as my old and my new black, and green, and red. 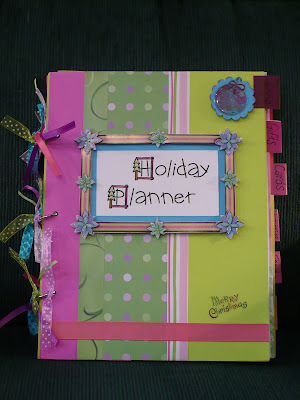 It loosely follows (are you still with me) that I would create an 'alternative and bohemian' HOLIDAY PLANNER...in pink! Today, I dedicate this post to all those who always loved the color pink and to all those who have come to love the color pink, whether through dedication to the many pink breast cancer campaigns or just because it is about the most child like and innocent color in the world! Let me take you there...just think candy floss - the original kind, just think Double Bubble bubble gum - the original kind! And the list of pink-ness just goes on...the gift that keeps on giving. SQUISHY HUGS. 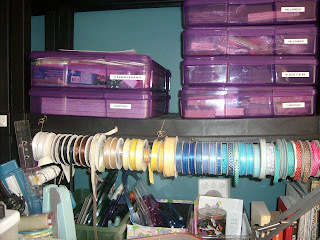 For this project I used every bit of stash I could find that was PINK! 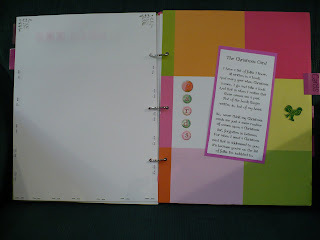 For the columns and written verses: I gathered these from various spots and reproduced on word perfect. 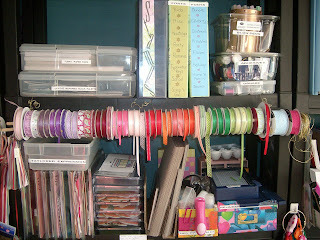 For bulbs and ornaments etc: I cut these out of inexpensive card stock and wrapping paper. 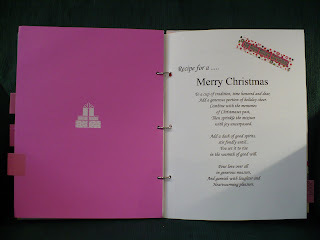 Rub-On Christmas Sheets: These can be found all over at this time of year....even in PINK!